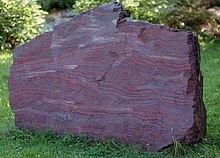 Metallic iron is virtually unknown on the surface of the Earth except as iron-nickel alloys from meteorites and very rare forms of deep mantle xenoliths. Iron metorites themselves are thought to have originated from stellar bodies larger than 1000 km in diameter. The origin of iron can be ultimately traced to formation through nuclear fusion in stars and most of the iron is thought to have originated in dying stars that are large enough to collapse or explode as supernovae. 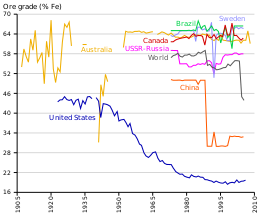 Although iron is the fourth most abundant element in the Earth's crust, comprising about 5%, the vast majority is bound in silicate or more rarely carbonate minerals (for more information, see iron cycle). The thermodynamic barriers to separating pure iron from these minerals are formidable and energy intensive, therefore all sources of iron used by human industry exploit comparatively rarer iron oxide minerals, primarily hematite. 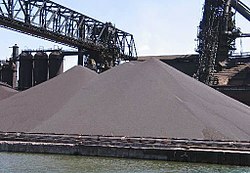 Usable iron ore production in million metric tons for 2015The mine production estimates for China are estimated from the National Bureau of Statistics China's crude ore statistics, rather than usable ore as reported for the other countries. ^ Goldstein, J.I. ; Scott, E.R.D. ; Chabot, N.L. (2009). "Iron meteorites: Crystallization, thermal history, parent bodies, and origin". Geochemistry. 69 (4): 293–325. doi:10.1016/j.chemer.2009.01.002. ^ Frey, Perry A.; Reed, George H. (2012-09-21). "The Ubiquity of Iron". ACS Chemical Biology. 7 (9): 1477–1481. doi:10.1021/cb300323q. ISSN 1554-8929.